These Soft Frosted Sugar Cookies are rumored to be even better than the ones you can find in grocery store bakeries. I do not like the fake frosting on those kinds of cookies, so I think these homemade ones with a buttery vanilla frosting are a much better alternative. I've made these many times, and they are quickly becoming one of my favorite cookies! *This is a large amount of vanilla extract and will affect the color of the frosting. If you wish to have a lighter, butter-colored frosting, use clear vanilla extract. 1. In a medium bowl, whisk together the flour, baking powder, and salt. 2. In the bowl of an electric mixer, combine the butter and sugar. Beat on medium-high speed until soft and fluffy, ~2 - 3 minutes. 3. Beat in the eggs one at a time, mixing well after each addition. Scrape down the bowl as needed. Blend in the vanilla. 4. With the mixer on low, add the dry ingredients. Mix until just incorporated. 5. Cover dough and chill for 1 hour. Meanwhile, preheat the oven to 350F and line baking sheets with parchment paper. 6. When dough is chilled, scoop a scant quarter cup of dough and roll into a ball. I weighed out the whole ball of dough on a kitchen scale and divided it by 24. Each of my cookies was around 2 ounces in weight. Flatten the ball slightly depending on the thickness you desire. 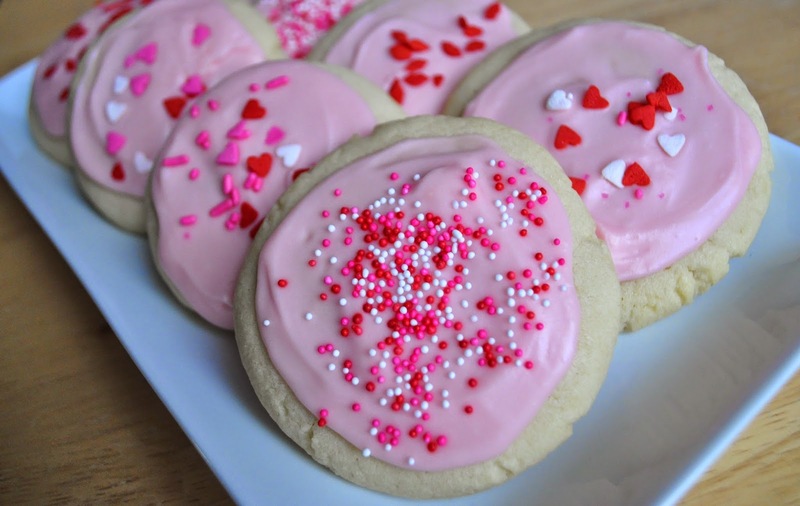 The cookies will not spread or flatten much during baking. Repeat this process with the remaining dough and space the cookies ~2 - 3 inches apart on the baking sheet. 7. Bake 10 - 12 minutes or just until set. Do not over bake! The edges should not be brown. Remove from oven and let the cookies cool on the baking sheet for several minutes before transferring to a wire rack to cool completely. 8. To make the frosting, combine the powdered sugar, melted butter, vanilla, and milk in a medium bowl by whisking until smooth. Start with the smaller amount of milk and add more if needed to reach spreadable consistency. If you add too much milk, the frosting will slide off the cookies. You may add more powdered sugar to thicken if it is too thin. 9. Tint frosting with food coloring or gel as desired. Frost the cooled cookies with an offset spatula or spoon. Immediately decorate with sprinkles if desired, otherwise the frosting will crust and the sprinkles will not adhere well. If you need to step away for more than a moment, place a damp paper towel over the frosting to keep it from crusting. If frosting begins to thicken, add a bit more milk. Store the frosted cookies in an airtight container.